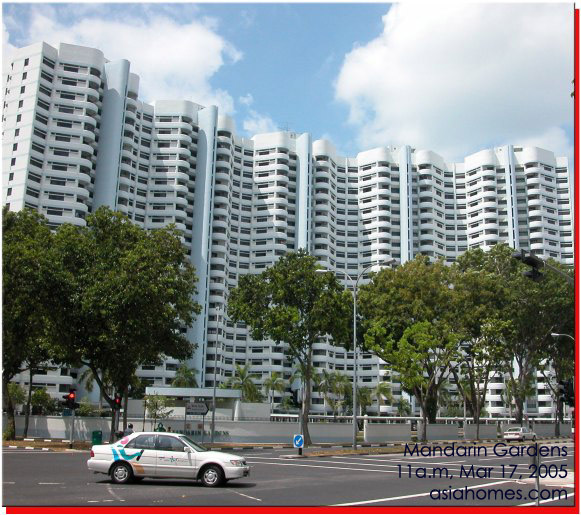 1, 3, 5, 7 Siglap Road, Completed: 1976. 1000 units. 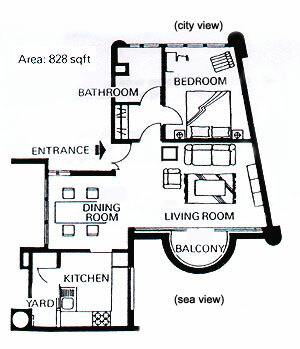 3-bedroom: 142 - 195 sq. m.
The bigger 3-bedroom units of 195 sq. m are maisonettes with 2 big balconies and bedrooms upstairs. Finishes: Living and dining have ceramic tiles but some owners have upgraded to marble flooring. 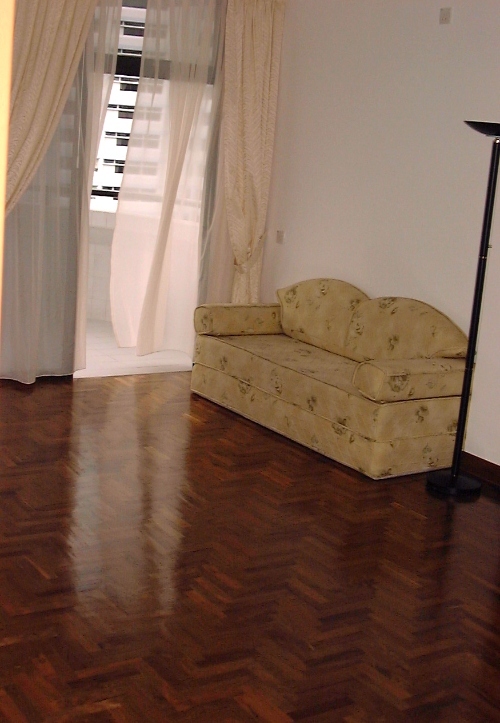 Bedrooms have parquet flooring. Built-in wardrobes, kitchen cabinet, balcony in living room and master bedroom. Window unit air conditioning are commonly seen unless the owner has upgraded to split unit air. conditioners. 3-bedroom units have 2 doors-in-one in master bedroom. The first door is the bedroom door and the 2nd door opens to the lift lobby outside. Some Owners block this emergency door with a writing table. A kindergarten inside condo attracts Caucasian mothers. Underpass to East Coast outside condo across expressway to continue jogging in a 5-minute walk. Occupancy Rate: High. Rentals are lower than brand new condos but the bedrooms are more spacious. Lower rental per sq. m compared to the new condos. The semi-circular balconies attract many Caucasian expatriate tenants. 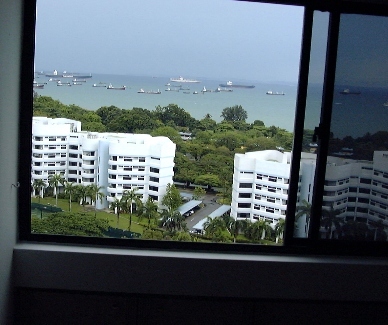 Some units have fantastic sea views and yet are not near the noisy expressway. 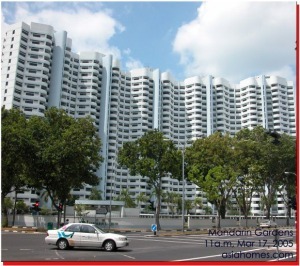 Mandarin Gardens condos are in great demand. An under pass to the East Coast Park and beach. 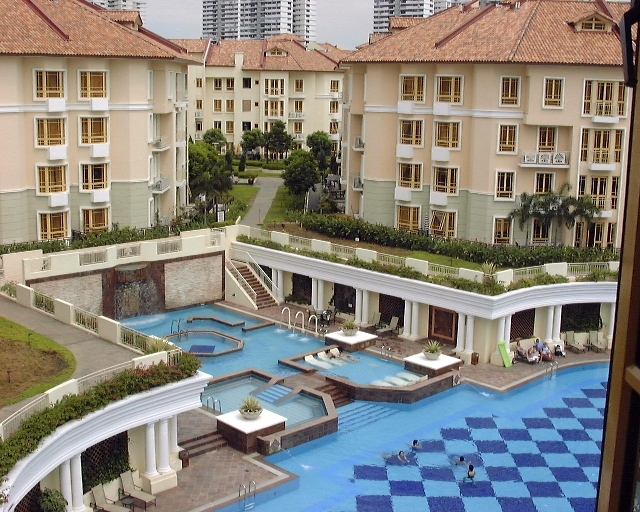 A resort-ambience, though condo is a high density one. Buildings are spaced further apart than most brand new condos, giving a sense of spaciousness. A large Caucasian and Japanese expat enclave with many small children. Kindergarten inside condo is convenient as some expat mothers do work. 3+1 favoured by expats with one child as there is an extra room for guests. Parkway Parade supermarket and neighbourhood shops nearby. 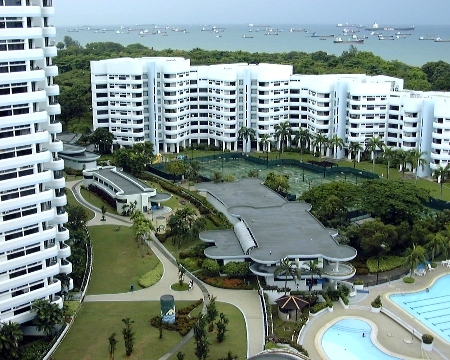 Older condo but premises are upgraded. High density. The usual complaint of expressway traffic noises for units fronting the CTE expressway. A common Caucasian complaint is that there are cabinets cluttering the area near the staircase of the 2nd floor passageway outside the master bedrooms, worn out long bath tubs and window unit air conditioners. Half-renovated looks: Some owners renovate partly leaving dated long bath tubs and window unit conditioners behind. Oct 8 1998 Case Study: Landlord, attracting Tenants. Closing on an expat family with a 5-year old child. 3rd floor. Not much view from living room. Older common furniture but clean. Landlord had placed a big desk flushed against the emergency escape door of master bedroom (the 2-doors in one for 3+1 described above), bolting it. 12th floor. Sea view seen and half view of pool. New light-coloured pine-wood dining table (actually 2 square tables) with 6 chairs, glass-door cupboard, display book-case shelvings, washer, dryer, conventional oven. Folding-door kitchen hatch. Shoe rack. Grey lounge set stained by wear and tear. Light coloured bed frame and small desk in master bedroom. Beds in all rooms. Window-unit air conditioning in bedrooms. Plain purple curtains in living room and deep blue ones in bedrooms. Utility area exposed to burglars who can climb into unit from air well. 23rd floor. 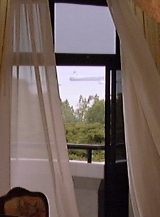 Excellent sea views marred by window grilles for balcony of living room. Black lounge sets, black dining table, black TV stands. No conventional oven. Brighter lobby and kitchen. Split-unit air conditioning in all rooms. The mood was depressive since unit has so many black items although lift lobby and kitchen are brighter despite being evening time. Closing: 12th floor. Husband was the decision maker. This case typifies what attract Tenants. *clean white ceramic tiles in living room. The pool has water falls. 6 white jacuzzi beds (see image, CLICK thumbnail to see bigger picture) inside water to pamper you. has captured a significant number of younger tenants. 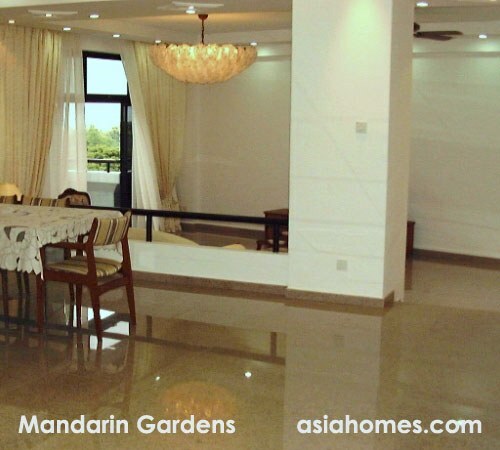 Email judy@asiahomes.com or tel: +65 9668 6468 now! 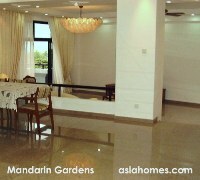 Mandarin Gardens are available for rent. 3+1 2024 sq. ft $4,800. Breezy with sea views seen from the dining area. Brand new granite tiles of spacious living and dining areas. Brand new yellow kitchen cabinets with dark blue counter. Brand new bathrooms. Master bathroom has a big white bath tub. Split unit air conditioners in master bedroom which has a big balcony. Note that the other two bedrooms have a window unit air conditioner.